If you prefer to grow more colourful, ornamental sunflower varieties we also have the Sunflower 'Evening Sun' mix available. Sunflowers were first cultivated in North and Central America where they naturally grow as a multi-headed, branching annual herb. Plant breeding has created sunflower varieties with a single, large head on a central stem with a greater quantity of plumper seeds. Sunflowers get their name both from their appearance as well as the tendency for young flowers and buds to track and face towards the sun as it passes through the sky. Older flowers are actually fixed and don't track the sun, contrary to popular belief. Sunbird is an open-pollinated, heirloom sunflower variety that grows to about 2m tall. It's been a favourite variety of Australian gardeners for many years. Hulled sunflower seeds are edible both raw and more commonly when lightly roasted and salted. This variety has large grey and white striped seeds with a good flavour. Sunflower seeds can be made into a paste as an alternative to peanut butter. The hulled seeds are commonly used in baking, particularly as a topping for rustic breads. Sunflower seeds can also be sprouted and eaten as a nutritious micro-green. Sunflower stalks are sturdy and can be used as living trellises for cucumber vines and other smaller climbing plants. A few rows of sunflowers can make an effective windbreak to shelter more susceptible plants behind them. Both the seeds as well as the leaves of sunflower plants can be feed to chickens. Sunflowers are good at extracting toxins from soils and will accumulate lead and arsenic from contaminated soils. They were even planted to help remove radioactive elements from the disaster sites of Chernobyl and the more recent Fukushima nuclear plants. Planting sunflowers will help to attract beneficial insect pollinators such as bees to your garden as well as the adult stages of various predatory insect species. Sunflowers are easy to grow and the almost comical size of their flowers are great for getting kids interested in gardening. Sunflowers will grow and produce best in a location that receives full sun, but they'll also grow reasonably well in light shade. Plants grown in too much shade may become leggy and require staking. Sunflowers require a free draining soil to grow well, grow sunflowers in raised beds if your natural soil is too compacted or heavy with clay. Dig lots of organic matter including well-rotted manures, compost and worm castings through your beds prior to sowing sunflower seeds to improve your soil structure, encourage worms and soil micro-organisms, and give your young sunflower plants the nutrients they need to thrive. Sunflowers can be heavy feeders so fertilise them every few weeks during the growing season with a complete organic liquid fertiliser, worm juice or compost tea. Although Sunbird is a more drought-tolerant variety, sunflowers won't produce well without regular watering, don't allow the soil to fully dry out for too long. Mulch around sunflower plants heavily with sugar cane mulch to retain moisture and suppress weed growth. Sunbird is a variety with good disease resistance. Sunflowers grows best in soil with a pH range between 6.0 and 7.5. 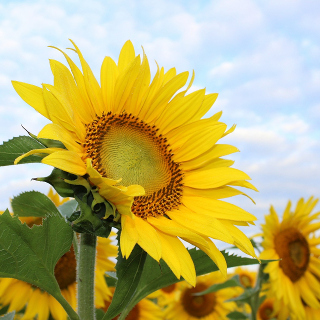 Sunflowers grown near corn, cucumbers and tomatoes can help to improve their growth. Sunflowers can be planted as a secondary trap crop around cauliflowers, their flower heads will be attractive to certain species of pollen beetle that would otherwise feed on the cauliflowers. When in flower at right time, sunflowers planted near chilli and capsicum bushes will attract beneficial insect species to feed on and reduce the population of problematic thrip species. Similarly, planting sunflowers can also help to reduce aphid populations on various garden plants. Avoid growing sunflowers close to bush or climbing beans or near potato bushes as they can have a detrimental effect on growth of these plants. In cold and mountainous areas of Australia sow Sunbird Sunflower seeds once the weather warms following Winter, from October to December. In temperate areas of Australia sow Sunbird Sunflowers from August to January. In subtropical areas of Australia sow Sunbird Sunflowers from August to April. In tropical areas of Australia sow Sunbird Sunflower seeds during the dry season from April to August. Sow Sunbird Sunflower seeds 1cm deep spacing plants about 25cm apart to give them room to grow. Sunflowers don't like to be transplanted, so sow the seeds directly in the ground where they are to grow. The majority of sunflower seedlings will emerge 7 to 10 days after sowing the seeds. This variety takes between 9 and 10 weeks to begin flowering. The seeds will be ripe and ready for harvest about a month after the flowers fully emerge. Wait until the plants starts to die off before harvesting the flower heads. Bag the heads once pollinated if birds are taking more than their fair share of the seeds.